The teacher is at the very center of the Tibetan Buddhist world. 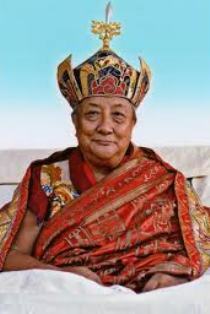 Dilgo Khyentse Rinpoche was the archetype of the spiritual teacher. His inner journey led him to an extraordinary depth of knowledge and enabled him to be, for all who met him, a fountain of loving kindness, wisdom, and compassion. 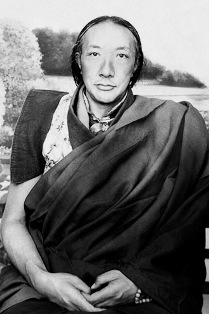 Dilgo Khyentse Rinpoche was born in 1910 in Eastern Tibet to a family descended from the royal lineage of the ninth century king Trisong Detsen. When he was still in his mother’s womb, he was recognized as a tulku or incarnation by the illustrious teacher, Mipham Rinpoche. He was later enthroned as an emanation of Jamyang Khyentse Wangpo, one of the most important tertons (treasure-finders) and writers of the 19th century. Khyen-tse means wisdom and love. He later spent many years with Dzongsar Khyentse Chokyi Lodro (1893-1959) receiving empowerments and teachings. When he told his teacher that he wanted to spend the rest of his life in solitary retreats, Chokyi Lodro answered, “The time has come for you to teach and transmit to others the precious teachings you have received.” Since then, Rinpoche worked for the benefit of others with the tireless energy that is the hallmark of the Khyentse lineage. He was a great teacher and terton, and was the most eminent modern day proponent of the non-sectarian or Rimed tradition. His Terma (rediscovered texts) fill five volumes. In the late 1950’s Khyentse Rinpoche and his family, his wife, Khandro Lhamo, and their two young daughters, fled Tibet. They were welcomed in Bhutan by the Bhutanese Royal Family. Rinpoche began anew, teaching in a large school near the country’s capital. Soon his inner qualities drew many students to him, and as the years passed he became the foremost Buddhist teacher in Bhutan, revered by all from the King to the humblest farmer. In Bhutan, Rinpoche gave teachings, performed ceremonies, wrote treaties and texts, and oversaw the preservation and construction of numerous stupas and statues. Rinpoche devoted considerable efforts to founding and sustaining temples, colleges, and monasteries where study and practice of the Buddhist tradition could be undertaken. One of his last activities was the founding of Shechen Tennyi Dargyeling Monastery, in Nepal. There he transplanted the rich Shechen tradition to a new home – a magnificent monastery near the great Stupa of Bodhanath. It was his wish that the teachings be continued in their authentic purity, just as they were studied and practiced in Tibet. He appointed his grandson, Rabjam Rinpoche as abbot of the monastery. The monastery now has over 300 monks studying and practicing under its auspices. In India, he built a stupa at Bodhgaya, and planned to construct seven stupas in pilgrimage places to avert conflict, disease, and famine, and promote world peace. Khyentse Rinpoche was widely regarded as one of the greatest Dzogchen masters of his time and was the teacher of many important lamas including His Holiness the Dalai Lama, Shechen Rabjam Rinpoche, Pema Wangyal Rinpoche, Chogyam Trungpa Rinpoche, Sogyal Rinpoche, Dzigar Kontrul Rinpoche, and other teachers from the four schools of Tibetan Buddhism. In 1985 Rinpoche made the first of three extended visits to Tibet. He inaugurated the rebuilding of the original Shechen Monastery which had been destroyed during the Cultural Revolution. While in Central Tibet, he petitioned the Chinese government for permission to restore Samye Monastery stressing its importance for the world’s cultural heritage. Samye, founded in the eighth century, was the first Buddhist monastery in Tibet and by 1990 its main temple had been restored. Wherever he went, he was greeted with great joy and emotion by people who had waited for years to see him again. Scholar, sage, and poet, Dilgo Khyentse Rinpoche never ceased to inspire all who encountered him through his extraordinary presence, simplicity, dignity, and humor. Wherever he was, he would always pray and meditate for several hours before dawn and then embark on an uninterrupted flow of activities and teachings – in gatherings ranging from a few dozen to several thousand people – until late into the night. His immense knowledge, the warmth of his blessings, and the depth of his inner realization gave his teachings a quality quite different from others.